Based on the multitude of blogs in Internet land, it’s easy to feel inadequate in the kitchen. So many bloggers project an image of detailed menu planning, access to picture-perfect locally grown seasonal ingredients, and impeccable housekeeping. I realize it could be illusion, but it highlights my own reality of day-to-day (sometimes last minute) meal planning, a clean but “lived in” kitchen, and the ever-present feeling of trying to catch up. True confessions: being part of a cooking group like Cook the Book Fridays, I like that the various recipe selections eliminate a decision to be made, though I’m always losing track of the schedule. My lack of pre-planning means that I often don’t think about how to incorporate these recipes into our meals in a logical way. 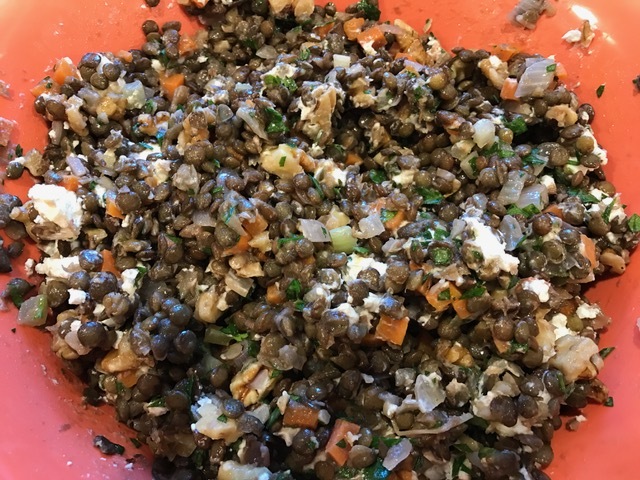 This week’s recipe for French Lentil Salad with Goat Cheese and Walnuts is a side dish that could go with almost anything. I adore lentils, especially the tiny French lentils. If you take care not to overcook them, they are perfect in a salad. 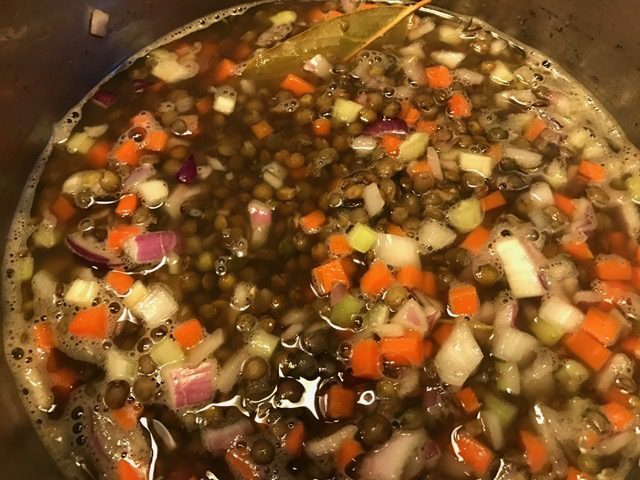 I’ve made lentil salads similar to David Lebovitz’s recipe from My Paris Kitchen, but there are a few takeaways that I particularly liked with this recipe. For example, I usually add raw crunchy vegetables (i.e. carrots, celery, and red onion). In this recipe, they are added the pot of lentils for the last few minutes of cooking. The veggies retain their crunch but the brief cooking softens them ever so slightly for a texture that feels just right. Minced shallots in the dressing add an extra oniony note. The toasted walnuts were also a delicious touch. While the goat cheese was complementary to the flavors, I think I might have liked the salad more without it. It would keep a little better too. Goat cheese is also the only ingredients that isn’t reliably on-hand in my fridge, allowing this to be made on a whim. Overall, this is a nice version of lentil salad that I might make again. To see what my friends thought of the lentil salad, check their links here. To make it yourself, the lentil salad can be found on page 233 of My Paris Kitchen or The Splendid Table’s website. Speaking of lack of planning, I also made the Hummus that my friends made a couple of weeks ago. I made it on time, but didn’t have a chance to write a post about it. Wow! 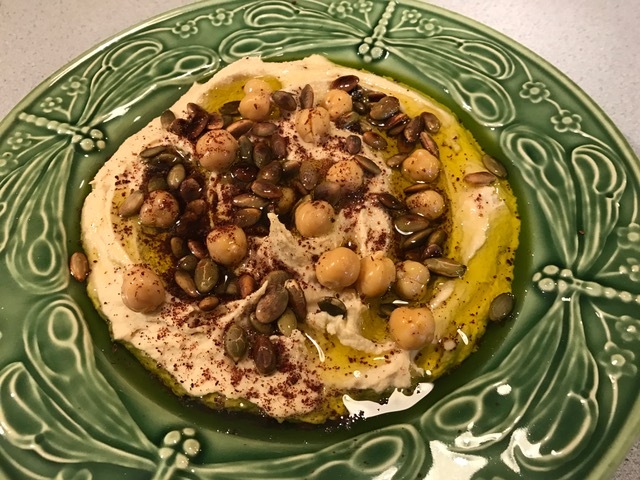 I’ve been making hummus for decades, but there is something about this recipe that takes it to a new level. It could be the ridiculous step of peeling the chickpeas, which sounds extraordinarily fussy. I’ve been reading that peeling them results in a silkier texture, but it’s time-consuming. I used canned beans (related to lack of planning) so I talked myself into the peeling step. It turned out to be easier than I thought. And the hummus turned out extra creamy. I did have to add at least half a cup of liquid to move it beyond pasty, but I was thrilled with the end result. David’s recipe had many suggestions for adorning the hummus. I sprinkled my bowl with sumac and toasted pumpkin seeds and the all-important glug of olive oil. This is hands-down the best hummus I’ve made at home. At some point, I’ll try it with home-cooked chickpeas. In the meantime, I stocked up on cans of chickpeas to make more. To see what my friends thought of the hummus, check their links here. The hummus recipe is on page 60 of My Paris Kitchen. A similar recipe can be found on David Lebovitz’s blog. I want to add a special shout out to my dear friend Katie of Prof Who Cooks who keeps Cook the Book Fridays moving along. It’s her birthday today! Help me wish her a very happy day! Hey Summer, Where Are You? Local farmers’ markets are just starting to open for the season. I pick up my first week’s CSA share tomorrow. My vegetable garden is planted but sunshine and heat are needed for it to grow. When summer tomatoes are at their peak later in the summer, Caprese salad with fresh mozzarella or burrata makes a regular appearance on my table, but it’s much too early for that. I saw a recipe in the New York Times a few weeks ago for a spring version with fava beans and fennel. Those aren’t in season yet either, but I felt inspired. What was fresh at today’s farmers’ market? 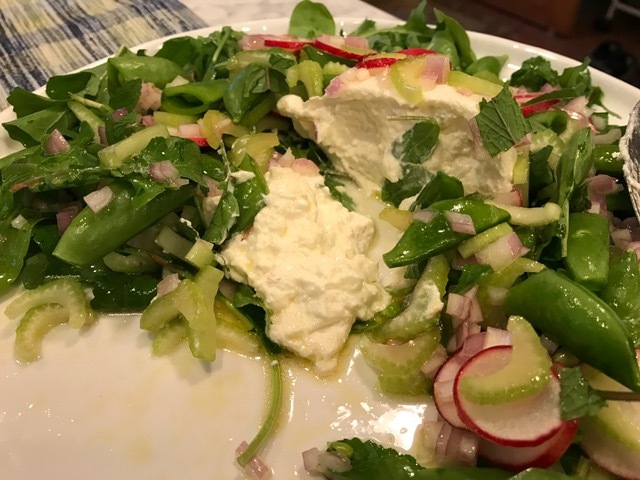 Radishes and sugar snap peas cried out to me. I also have plentiful arugula growing at home, self-sowed from last fall’s plants, and fresh mint in my herb garden. Here’s my version. The variety of color and textures is a treat for the senses. I love how I’ll be able to vary the ingredients as the season progresses towards tomatoes and beyond. In a small bowl, cover diced shallot with lemon juice. Add a pinch of salt, and let it sit while you prepare the vegetables (5-10 minutes). Then, whisk in olive oil. In another bowl, toss the radish slices, sliced celery, and peas together. Arrange the arugula on a plate. Place the burrata in the center. Scatter the mixed vegetables over the arugula and burrata. Spoon about half of the dressing over the salad. Finally, tear the leaves from the mint sprig into small pieces and sprinkle over the salad. Serve immediately. 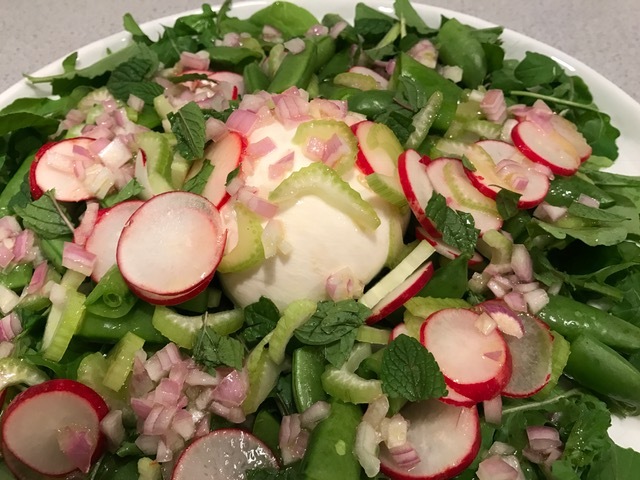 Use a serving spoon to cut the burrata in half or quarters as the salad is served.